In the immediate aftermath of England's appalling 2011 World Cup a number of names were bandied around as possible successors as coach to Martin Johnson. It would not be unfair to say Stuart Lancaster did not feature. 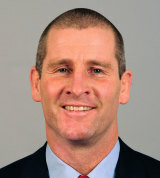 But after landing the job on a temporary basis as the RFU scrambled around to find the right candidate, Lancaster turned England from laughing stock to respectability in the course of the five Six Nations games in 2012 and his resulting appointment was, according to the media at least, a certainty. A flanker and captain in his playing days at Leeds from 1992 to 2000, he served as academy manager from its inauguration in 2001 until 2005 before a brief spell as director of rugby during which he steered them back into the top flight. He joined the RFU in 2007 before taking charge of the Saxons the following year. He steered the Saxons to Churchill Cup glory in 2008, 2010 and 2011 and oversaw an impressive period for England Under-20s as they appeared in three out of the four Junior World Championship finals between 2008 and 11 and secured a Six Nations Grand Slam in 2011. His experience and familiarity with the elite rugby department saw him appointed as interim head coach for the 2012 Six Nations but few saw that as anything but a stop-gap move. Such had his stock risen five matches - and four wins - later that he easily beat off competition from former South Africa and Italy coach Nick Mallett.